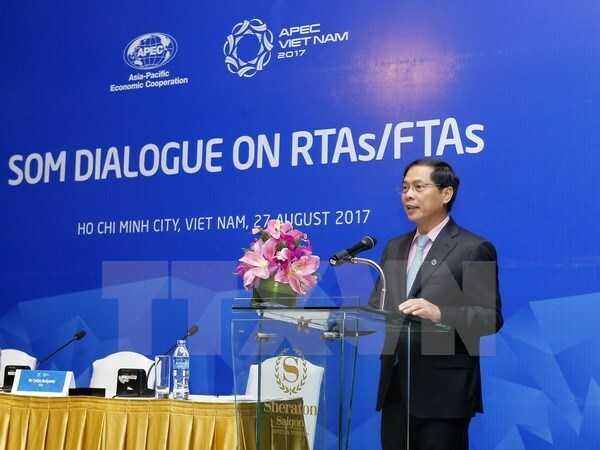 HCM City (VNA) – APEC officials shared views and experience in negotiating, concluding and implementing regional trade agreements (RTAs) and free trade agreements (FTAs) at a dialogue in Ho Chi Minh City on August 27. Thanks to their impacts, intra-APEC trade has increased by 174 percent, from 2.3 trillion USD to 6.3 trillion USD during the 2000 – 2016 period. Regional economic integration will continue to be one of APEC’s core cooperation pillars, including fostering RTAs/FTAs and with a view to the realisation of the Free Trade Area of the Asia-Pacific (FTAAP), Son said.